ALL NEW for 2019 the CRF110F is now EFI. That's right fuel injection on a trail bike, no more boggy or funky carburetor. Call now for the best price available on this unit. Financing available (with approved credit) and trades welcome. 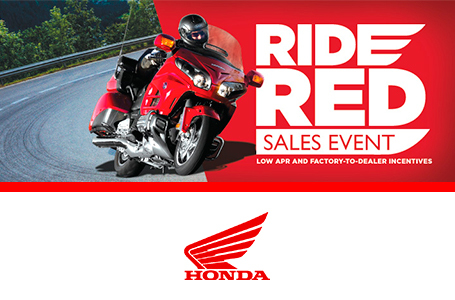 With over 30 years as a Honda dealer you can rely on us for the best service and price available. Web price is good until 4-30-19. 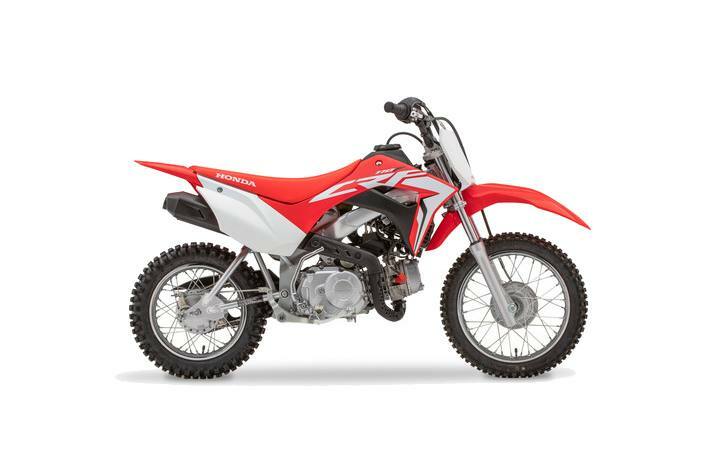 Honda's CRF110F is one of our smallest off-road motorcycles, but it's a giant in terms of features. Especially for 2019, because we've given this great little machine some major improvements. But first, you need to see if it's the right choice for your young Red Rider. In terms of seat height and weight, the CRF110F lives between our CRF125F and CRF50F. And like those two, it features a rugged air-cooled Honda single-cylinder engine that's positively legendary when it comes to long life, reliability, and a user-friendly powerband. But check this out: The new CRF110F is now fuel injected—which means you can say goodbye to clogged up pilot jets after the bike's sat out the winter. It also means easier starting and better running in cold weather or at high altitudes, and less pollution. Also new this year: More suspension travel, more seat padding, and a new steel frame that's just as rugged as ever. You still get a proven four-speed transmission and Honda automatic clutch, so you can shift, but there's no fear of stalling out. It all adds up to a totally new machine that's even more fun to ride (and for parents to own). The new 2019 CRF110F. Styled like our championship-winning CRF motocrossers, it's a better choice than ever. New Fuel-Injected Engin: The CRF110F's 109cc engine offers a generous, wide powerband. New fuel injection this year makes starting easier than ever. Plus, the CRF110F offers a throttle limiter to allow parents to choose the appropriate amount of available power. No Clutch Lever, No Worrie: With our proven four-speed transmission and automatic clutch, riders can concentrate on shifting gears without the worry of a manual clutch or stalling. Get Them Off to A Great Star: The CRF110F includes an effortless electric starter. We've even included a backup kick starter, so getting underway is a cinch, even if the battery charge gets low. Automatic Clutch: There's no clutch lever for new riders to master, and that means no stalling. In addition, the smooth transmission offers four gear ratios. All you do is shift with your foot. New Steel Frame & Swingarm: Less experienced riders are hard on equipment, especially when they're just starting out. That's why we gave the CRF110F a strong, new, twin-spar-type steel frame and swingarm that are built to handle the bumps and dings of off-road riding. Four-Stroke Engine: The CRF110F's dependable four-stroke single-cylinder engine offers good performance with a wide powerband—perfect for a wide range of riders including beginners. And because it's a Honda, you know it's reliable, too. Low Seat Height: It's important to have a bike that's sized right for your rider. The CRF110F's low seat height helps build confidence right from the start. Its seat height fits nicely between the CRF50F and CRF125F. Electric Starter: Push a button and go—that's how easy it is to get going on a CRF110F. Starts after a tip-over are a snap, and the push button means no frustration if junior accidentally stops the engine. Backup Kick Starter: Even if the bike's been sitting all winter, you still can get going with the CRF110F's kick starter. It's easy for you to use, and it helps insure that your day of fun doesn't stop. Tough Bodywork: Riders can be tough on equipment, and taking a spill is a natural part of learning. But the CRF110F can handle it. With tough plastic fenders, tank, and other body parts designed to look like our bigger CRF motocross bikes', the CRF110F is engineered to shrug off the minor dings of the real world. More Suspension Travel: While we were redesigning the CRF110F's new frame, we gave the rear suspension additional travel for a smoother ride. Clean-Running Engine: Another benefit of fitting the CRF110F with fuel injection? Now it even meets California's stringent CARB emissions standards for off-road motorcycles—good news for everyone.